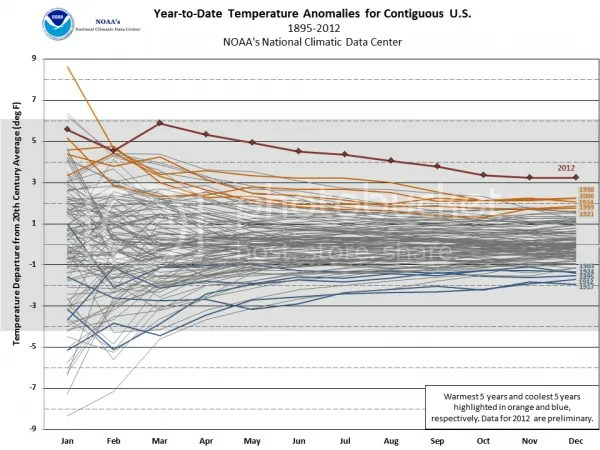 Figure 1 – NOAA Graph showing year-to-date average US temperatures from 1895-2012. 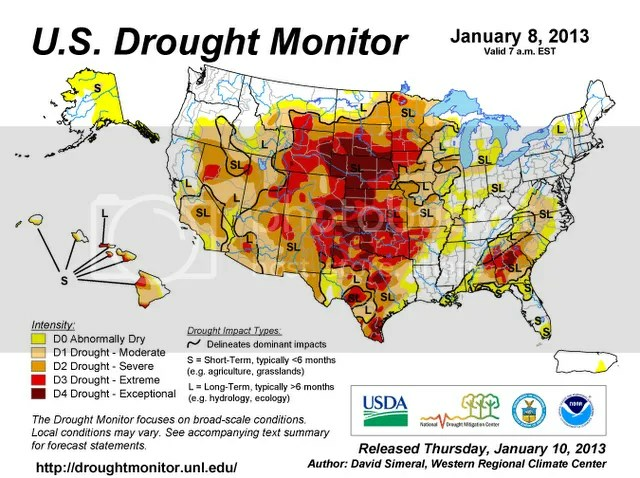 Figure 2 – US Drought Monitor map of drought conditions as of the 8th of January. Corn prices are 3x what the average price from 1988-2006. Soybean prices are more than 2X their average price from 1988-2006. Wheat prices are more than 2X their average price from 1988-2006. If nothing else, we will likely see a great deal of price volatility in crop prices in 2013. But any further price increases will pinch most of our bank accounts more so than they already are. This is another downstream effect of climate change and the lack of a national climate policy. Moreover, how are farmers supposed to stay afloat if they never take climate change effects (record high temperatures and widespread drought) into account? As elected officials in D.C. continue to think there is not enough political capital in return for climate change action, crop prices double and triple, impacting every person in the country. We need to remove the politicization surrounding the issue. Categories: drought, environment, global warming, policy, science | Tags: 2012 temperature record, 2013 drought, agriculture, agriculture policy, all-time record temperatures, climate policy, crop prices, drought, policy, US Drought Monitor, USDA | Permalink. It’s official: 2012 was indeed the hottest year in 100+ years of record keeping for the contiguous U.S. (lower 48 states). The record-breaking heat in March certainly set the table for the record and the heat just kept coming through the summer. The previous record holder is very noteworthy. 2012 broke 1998’s record by more than 1°F! Does that sound small? Let’s put in perspective: that’s the average temperature for thousands of weather stations across a country over 3,000,000 sq. mi. in area for an entire year. Previously to 2012, temperature records were broken by tenths of a degree or so. Additionally, 1998 was the year that a high magnitude El Niño occurred. This El Niño event caused global temperatures to spike to then-record values. The latest La Niña event, by contrast, wrapped up during 2012. La Niñas typically keep global temperatures cooler than they otherwise would be. So this new record is truly astounding! The official national annual mean temperature: 55.3°F, which was 3.3°F above the 20th century mean value of 52°F. This first graph shows that January and February started out warmer than usual (top-5), but it was March that separated 2012 from any other year on record. The heat of July also caused the year-to-date average temperature to further separate 2012 from other years. Note the separation between 2012 and the previous five-warmest years on record from March through December. Note further that four of the six warmest years on record occurred since 1999. Only 1921 and 1934 made the top-five before 2012 and now 1921 will drop off that list. Figure 2 – Contiguous US map showing state-based ranks of 2012 average temperature. Nineteen states set all-time annual average temperature records. This makes sense since dozens of individual stations set all-time monthly and annual temperature records. Another nine states witnessed their 2nd warmest year on record. Nine more states had top-five warmest years. Only one state (Washington) wasn’t classified as “Much Above Normal” for the entire year. The 2012 heat wave was extensive in space and severe in magnitude. Usually, dryness tends to accompany La Niña events for the western and central US. This condition was present again in 2012, as the next figure shows. Figure 3 – Contiguous US map showing state-based ranks of 2012 average precipitation. As usual, precipitation patterns were more complex than were temperature patterns. Record dryness occurred in Nebraska and Wyoming. Colorado and New Mexico saw bottom-five precipitation years. Severely dry conditions spread across the Midwest all the way to the mid-Atlantic and Georgia continued to experience dryness. Washington and Oregon were wetter than normal as a result of the northerly position of the mean jet stream in 2012. Louisiana and Mississippi saw wetter than normal conditions, largely as a result of Hurricane Isaac. Figure 4 – Contiguous US map showing state-based average actual precipitation. I always find it useful to know the magnitude of measurements as well as how they stack up comparatively. Figure 4 provides the former while Figure 3 provides the latter. “Normal” precipitation varies widely across the country and even between neighboring states. How much precipitation fell to allow NE and WY to record driest years on record? 13.04 and 8.03″, respectively. Another useful map would be state-based difference from “normal”. So the brutal heat that most Americans experienced was one for the record books. As the jet stream remained in a more northerly than usual position, heat across the country dominated. More heat and fewer storm systems in 2012 meant widespread and severe drought expanded across the country. That drought tended to reinforce both the temperatures recorded (drying soils meant incoming solar radiation was more easily converted directly to sensible heat) and the lack of precipitation (dry soils required extra moisture to return to normal conditions). Thankfully, record-setting temperatures didn’t occur all over the globe in 2012 (although Australia is having their own problems now in 2013). I therefore don’t expect 2012 will be the warmest year on record globally, but a top-10 finish certainly is not out of the question. Again, this is significant because of the extended La Niña event that ended in mid-2012. Without the influence of anthropogenic (man-made) climate change, 2012 probably would have been cooler than will be recorded. The background climate is warming and so La Niñas today are warmer than El Niños of yesterday. These warming and drying conditions have massive implications for our society. The drought that afflicted the Midwest in 2012 helped push up commodity prices as crops failed. If that trend continues into 2013, prices will rise further, which will pinch all of our finances. Drought in the Southwest and Midwest impacted flows in rivers (Colorado & Mississippi, among others). The former could mean imposed restrictions in 2013 while the latter could mean reduced river transportation, which puts further pressure on goods sold in the US. Conditions aren’t the worst recorded yet, but it is imperative that we examine resource management policies. Are policies robust enough to handle the variability of today’s climate? If not, they probably aren’t equipped to address future variability or change either. What systems are critical to today’s society? If the Southwest remains dry, does agriculture (largest user of CO river water) reduce its use or do urban users? What sets of values guide these and other decision-making processes? Categories: drought, global warming, NOAA, policy, science | Tags: 2012 drought, 2012 temperature record, 2013 drought, all-time record temperatures, climate, climate policy, drought, El Niño, La Nina, Midwest drought, NOAA, policy, record values, Southwest drought | Permalink. As of the September 1, 2012, there have been 67 90°F+ days – far and away the record number for one calendar year. That is 6 more than the previous record of 61 set in 2000! The list of the number of 90°F+ days in a year can be found at this NWS link. August 2012 went down in Denver history as the 5th warmest and 4th driest on record. The average temperature for the entire month was 75.0°F, 2°F cooler than August 2011. The total rainfall for the month occurred during one storm – 0.11″. That monthly total is 1.58″ below the monthly average and 0.09″ more than the driest August on record in 1924. Today and the next two days are forecasted to be 90°F+, followed by two days of mid-80s. It would be incredibly significant if 2012 recorded 1/6 more 90°F+ days as the previous record. This week might not see all of the 90°F+ days (although I certainly hope they end on Tuesday!) as short heat waves can set up in mid-September. Many folks along the Front Range are looking forward to autumn. Categories: drought, environment, global warming, NOAA, science | Tags: 100F days, 2012 drought, 2012 heat wave, 90F days, all-time record temperatures, record temperatures | Permalink. What is the difference between that record-setting July and August 2012? July’s average temperature was 78.9°F! The average temperature through 25 days in August 2012 is only 74.1°F, or 4.8°F cooler. The biggest difference hasn’t been the maximum temperatures, it has been the minimum temperatures: instead of high 60s, nightly low temperatures have been much more comfortable in the high 50s. The record number of 90°F+ days will fall – that is certain now. The next three days are all forecasted to be 90°F+, and Thursday’s forecasted high of 89°F will also obviously challenge 90°F. 90°F+ days can also occur in September, so the total number may not be recorded on Wednesday. While August 2012 will not be in the top-10 warmest all-time, it just might challenge the 4th-driest August on record. Current month-to-date precipitation is only 0.11″. 1924 was the driest at 0.02″, 1900 and 1917 were 2nd driest at 0.05″, and 1960 was 3rd driest at 0.06″. Just behind 2012 is 1974 at 0.16″. It won’t take much of a rainstorm to boot 2012 out of the top-10, however. The 10th-driest year one record is 1985 at 0.28″. It does not look likely at this time that any additional precipitation will be recorded at Denver. A second cool front moved over the Denver, CO area on the 12th of August, preventing temperatures from climbing over 90°F for only the second day this month. Through the 12th, the NWS recorded 10 90°F+ days, including 3 days at 98°F – narrowly missing another 100°F reading. The total number of 90°F+ days for Denver so far in 2012 is now 56! That value ties for 3rd most 90°F+ days in Denver’s history, which occurred in 2002. Unlike 2002, Denver will very likely record additional 90°F+ days, which will move 2012 into at least sole possession of 3rd most 90°F+ days. Still ahead of 2012 and 2002 in the record books: 60 days in 1994 and 61 days in 2000. The high temperature in Denver could threaten 90°F, but might fall just short. Tomorrow and Wednesday should see 90°F+. The NWS forecasts includes another cool front to move through the area – giving us high temperatures of only 75°F or so! To put that in context, nighttime low temperatures were just slightly cooler than that early last week (69°F). Through Friday then, Denver should record 58 90°F+ days. The weekend could provide one or two more 90°F+ days (likely just one). That takes us just past mid-August. There will be a decent number of chances through mid-September to record additional 90°F+ days. So at this point, I feel confident that 2012 will challenge 2000 for the year with most 90°F+ days. In contrast, I am more convinced than last week that Denver will record no additional 100°F+ days in 2012. The above does not mean that the drought affecting Denver or Colorado is anywhere near over. We need serious precipitation and that isn’t likely to occur for a number of weeks still. Perhaps as we move into autumn and ENSO returns to neutral or weak El Nino conditions, some sub-tropical moisture will find its way over the US again. On the heels of the warmest July in Denver’s history, the first five days of August were also warmer than normal. Due to a cool front that made its way through the metro area Friday night, Saturday’s high temperature was only 83°F. Sunday was just as warm as Friday, however, with highs of 97°F and 98°F, respectively. Through the first five days of the month, the average high has been 93.0°F. The average temperature over those five days was 77.1°F – a clear reflection of how relatively cool Saturday’s temperatures were. The departure from normal tracked above 4°F, but is only 2.7°F now. You can bet that departure reading will edge back up toward 4°F given the lack of weather systems on the horizon. I still think Denver’s 100°F+ days are likely over for 2012. Despite my knowledge of future climate projections for the area, I sincerely hope 100°F+ days remain rare in my personal future. As many other cities across the US can attest, 100°F+ days are simply miserable, in addition to being dangerous to people’s’ health. 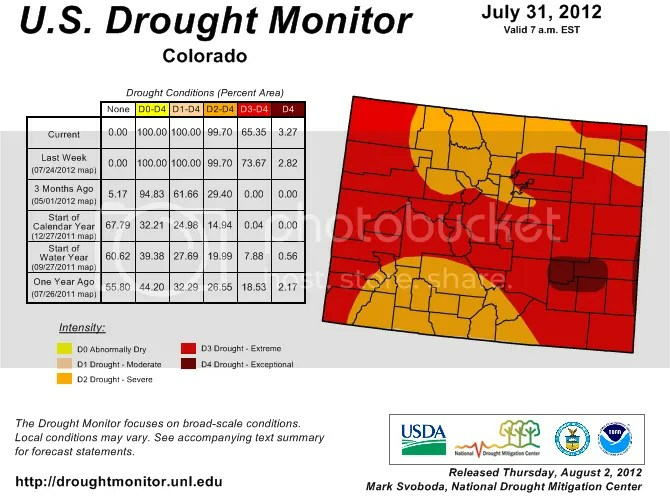 The Denver area continues to experience Severe to Extreme drought conditions (see figure below). I don’t think the last week’s rains will make a serious dent in those conditions. Figure 1. Drought conditions across Colorado as of July 31, 2012. The orange contour indicates Severe drought conditions; the red contour indicates Extreme drought conditions; the brick-red contour indicates Exceptional drought conditions. In the past couple of weeks, conditions have shifted spatially but haven’t worsened substantially. Some areas have actually seen slight relief from Extreme to Severe conditions. This is a shift from three months ago when, as the table in the figure shows, 0% of the state experienced Extreme conditions while 65-73% of the state experienced similar conditions in the past two weeks. Weather conditions over the next few weeks will determine the level of drought the state experiences. Saturday’s high of only 83°F (which felt fantastic!) also stopped the streak of consecutive 90°F+ days from early July through early August at 24. Once the NCDC confirms the temperatures, this streak will match the longest streak in Denver’s history, first set from July 13th through August 5th, 2008. Denver’s earlier streak of 15 consecutive 90°F+ days should tie for 5th on the all-time list. The record for total 90°F+ days in one calendar year is also in serious trouble. Through the 5th of August (yesterday), Denver had already recorded 50 such days in 2012 (2 in May, 17 in June, 27 in July, and 4 in August). That is enough days to tie for 9th on the all-time list. It seems incredible to someone who has lived in the area for a long time, but the all-time record of 61 90°F+ days seems easy to reach at this point in 2012. Denver has already surpassed 90°F today, and the NWS predicts similar highs for the next four days. That will mark 55 90°F+ days, good for a tie for the 4th most 90°F+ days and only 6 days from the all-time mark. The GFS model provides a glimpse for days beyond Friday and the pattern might change over the upcoming weekend: 90°F is the forecasted high for both days. Given recent history, I can easily envision highs of 91°F or 92°F, but I look forward to days that can no longer climb above 90°F. Categories: drought, environment, global warming | Tags: 100F days, 2012 drought, 2012 heat wave, 90F days, all-time record temperatures, record temperatures | Permalink.